Mercedes teammates Lewis Hamilton and Nico Rosberg have dominated Friday free practice at the Malaysian Grand Prix with an almost half-second margin to the next-fastest car. Hamilton led Rosberg by the end of the day, his 1 minute 34.944 seconds a little more than 0.2 seconds faster than the best time of the sister car. 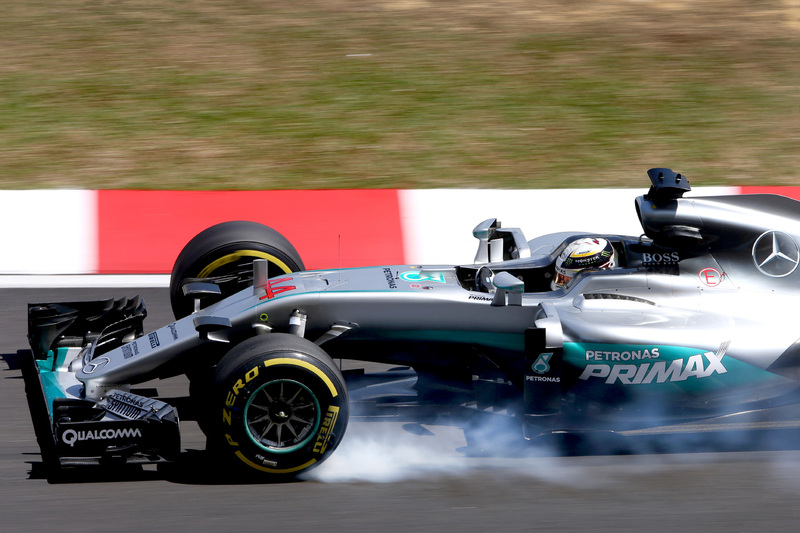 “That was a good day today,” Hamilton said after the uneventful final session. “No issues to report and we got through our run plans in both sessions. Mercedes is on the brink of winning its third constructors world championship this weekend, needing to prevent Red Bull Racing outscoring it by more than seven points to claim the crown. Concerning for Rosberg, however, is that Hamilton’s advantage was converted from a 0.4-second deficit in free practice one earlier in the day. Rosberg leads Hamilton in the drivers championship standings by eight points with six races remaining. Ferrari, returning to the scene of its first hybrid-era victory — at the hands of Sebastian Vettel last season — marked itself out as second best with reasonably competitive long-run pace. Vettel led the charge for the Scuderia but could lap only 0.661 seconds slower than the benchmark time. Vettel’s Ferrari teammate, Kimi Räikkönen, was 0.2 seconds behind the German after a slow start to free practice two as he grappled with his set-up kept him at the bottom of the time sheets for much of the afternoon. Max Verstappen was the fastest Red Bull Racing driver of the day, his time just outside the one-second threshold in fifth place. Verstappen, who turned 19 today, admitted the team had work to do on its single-lap pace before qualifying on Saturday afternoon, but he put faith in the car’s long-run pace to keep him competitive in the race on Sunday. Behind Verstappen finished Sergio Perez’s Force India and Fernando Alonso’s McLaren, the latter equipped with Honda’s new specification power unit. The Latin pair, along with Daniel Ricciardo in eighth, were separated by less than half a second approximately 1.3 seconds off the pace. The second Force India and McLaren rounded out the top 10, Nico Hülkenberg and Jenson Button 1.4 seconds and 1.7 seconds respectively off the pace. It was a straightforward day for most of the grid, with the only point of note being the track temperature, which some teams measured at above 60°C, the new, blacker asphalt readily absorbing the ambient warmth. Kevin Magnussen, for one, felt the heat when he jumped from his burning car just two laps into free practice one on Saturday morning. Renault attempted to extinguish the burning chassis, but a fuel leak at the very top of the roll hoop continued to spout petrol onto the car, where it subsequently ignited on the hot bodywork. Only after one mechanic managed to attach a pump to the car to drain out the fuel was the car able to wheeled safely back into its garage. Magnussen lost virtually all of free practice one and 40 minutes from free practice two due to the fire and residual damage, putting him on the back foot for the rest of the weekend.